Excellent chimp trekking forest south of Murchison Falls. Jinja is the second largest city in Uganda, after Kampala. It is located on the shores of Lake Victoria and is the site of the source of the River Nile. Lake Victoria is the biggest freshwater lake in Africa and forms a natural boundary between Kenya, Tanzania and Uganda.Kampala is the capital city of Uganda and a thriving business centre. Nearby Entebbe, a much sleeper small town on Lake Victoria. This national park takes its name from the magnificent waterfalls o the Nile within its borders. 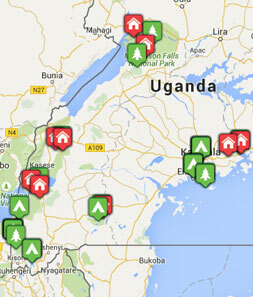 The park is Uganda's largest, and an increasingly good wildlife viewing spot. Ngamba Island is a sanctuary for orphaned chimpanzees, offering them a secure environment in which they can live out their lives.